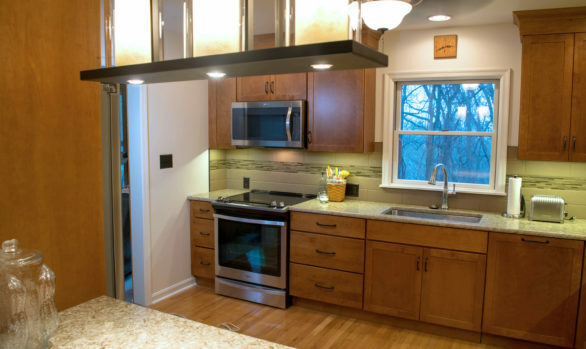 Napole granite countertops are just one part of this gorgeous home remodel. Small changes in the configuration of this kitchen made huge improvements! Originally, the low bar counter was being used as a desk. While that was OK, the homeowners really wanted their sink to be near the window so they could enjoy the view. Now they can look out of the new window and enjoy whatever is blooming in their new flower box. We removed part of the wall between the dining room and kitchen and installed stunning Napole granite countertops for the kitchen peninsula. The adjoining powder room got a makeover too: new DuraCeramic Tile flooring, Yorktowne Cabinetry, Napole granite countertop, and Moen fixtures in oil-rubbed bronze match the kitchen design. Now the home has a more open design, abundant countertop area, a designated coffee spot, and specialized storage. It’s the ideal space for entertaining family and friends! Are you interested in remodeling your home? 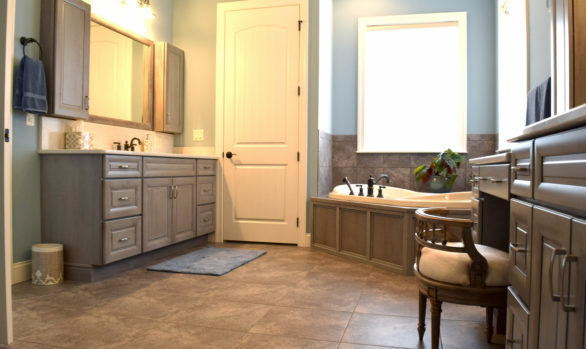 Harrisburg Kitchen and Bath is a design and remodeling firm you can trust! How can we help you? Looking for more ideas and personal assistance? We have the region’s largest showroom of fine cabinetry and fixtures! Like to be social? Join us to stay connected with our latest news.